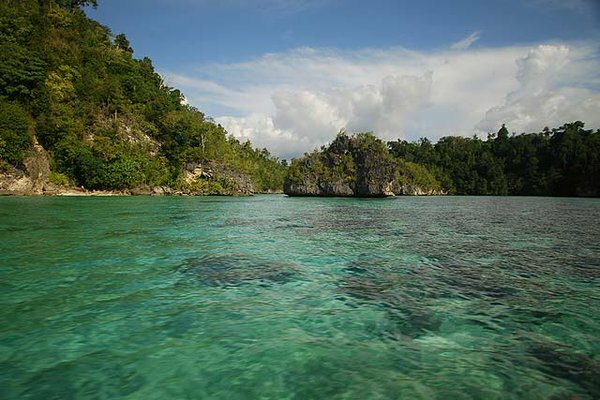 The island is still in the area of Togean Islands National Park in Ampana, Tojo Una-Una, Central Sulawesi province. Even so, the island is very rarely be mentioned in the travel map of Togean National Park area. Poya Lisa is a small and private island. The island is owned and managed directly by Mr. Ismail, a registered nurse in Bomba. It said that this is island was called Pulau Poya. Poya itself is the name of the person who first planted coconut trees on the island, making him as the owner of the island. Mr. Ismail recently purchased the island from Poya offspring that inherit the island. Meanwhile, Lisa is the name from German tourist who had come and spends her time on the island for a month. Being impressed by the beauty of this island, this tourist is begging for Mr. Ismail perpetuates his name on this island. So that this small island now known as Pulau Poya Lisa. Poya Lisa Island has white sandy beach and clear blue sea water. The lip of the beach is also overgrown with green trees that look refreshing. In this place, you can freely do activities like snorkeling, diving or touring the island by boat. It is certain that you will see stunning underwater scenery just like the surrounding. The island is a private island, so it is only inhabited by the manager and his relatives only. This makes the atmosphere on the island is very quiet and peacefull. This place will be the right place to find tranquility. On the island there are few cottages that directly managed by Mr. Ismail. The rent cost is around Rp 150,000 per night / person and includes meal for three times a day. The clean water and sanitation facilities are also available on the island. Unfortunately, the electricity on the island is only available from 18.00 until 24.00 pm. The same thing is also happen to the cellular signal that appears to be difficult to catch. But it does not reduce any comfort on this island. To go to this island, we can go through the city of Palu by using the route of Palu - Ampana - Bomba Island - Poya Lisa Island. From Palu, we can use land vehicles heading to Ampana, Toja Una-una regency, Central Sulawesi. From Ampana, we can hire a speedboat or small boat to get to the Bomba Island, and it takes 2 hours drive. Well, from Bomba Island, we continue to Pulau Poya Lisa around ten minute drive.